We finally got a bit of rain the last couple of days. Not really as much as we need but better than nothing. I decided to share this image as the Sunshine we missed out on for a bit. 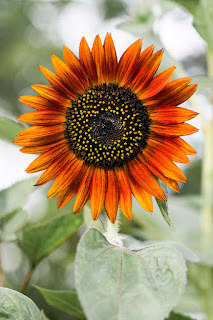 😃 This is an image of the red Sunflower I had growing in my yard that turned out so beautifully perfect. I had a few produce but not as nicely as this one did. I played with the image and muted the leaves around it.